Mulder searches for a way to tell Scully how he feels. Notes on Prayer: This started because I had so many projects partly finished and I was frustrated and wanted to finish something. So I was going to do one little vignette. HA! No such luck! However, do not be frightened off by the numerous parts - most are only 7K or 8K in length, and the longest is only 16K. Total for all eleven parts is 97K. And they are all being posted together. The Liturgy of the Hours is a form of prayer that seems to have originated with St. Benedict around A.D. 500. St. Benedict founded several monasteries and instituted what became known as the Rule of St. Benedict that is still in use in some monasteries today. 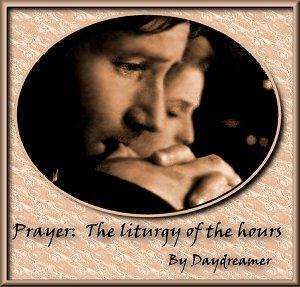 Many people still pray the Liturgy of the Hours, or the Divine Office as it is also called. The Divine Office has changed some over the years and most lay people no longer pray Tierce, Sext, or Nones. Matins and Prime have pretty much disappeared as well. But, for the sake of building this story, I have included all eight of the historical times, as well as two others, Chapter and Collation, which are explained in their summaries.